Are you looking to amp up your TPM (texts per minute)? 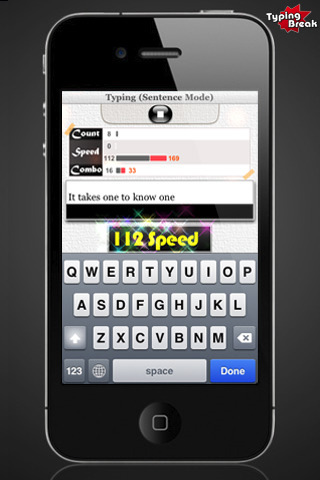 Typing Break is an app that helps you work on your texting speed by providing you with typing exercises. It was developed by Appspia Studio and has been marked down 50% for a limited time, so it currently costs $0.99. You can use it on an iPhone, iPod Touch, and iPad. Typing Break is broken down into 3 sections, Training, Typing, and Racing. 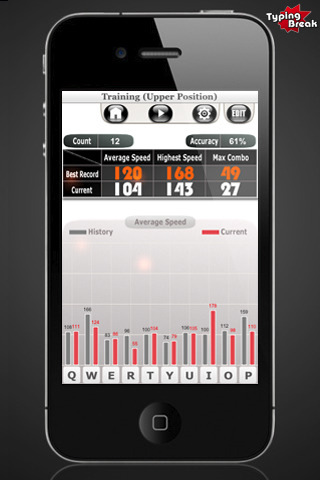 To start with Training, you get a choice of the upper, middle, or lower section of the keyboard. Once you have chosen, and hit play you are given a sequence of 5 letters that you follow with your keyboard; so if you chose the middle section you would get something like this, f d h s j. In the upper left corner you can keep track of your count, speed, and a combination of the two using the graph provided. The game will continue spitting sequences for you to type until you hit stop. You are then provided with all of your stats. The statistics they provide are actually pretty complex. They break down your speed as well as each of the letters in whichever section of the keyboard you were playing and how well you did on each of them. The Typing section is a little different. You get a choice of word mode or sentence mode. Obviously, sentence mode is harder. If you choose the word mode the game gives you names of countries to spell out, which serves a double purpose of helping us brush up on our geography skills. In the Racing section we get levels 1 through 32 to complete. You are racing against the computer and each level has a target count and required accuracy. I have been playing this game for a while and not only is it kind of fun but I have noticed a marked change in my texting speed (not that it needed to be any faster than it already is). If your friends constantly hound you about your texting speed and in the time it takes them to send you 5 texts you are still typing out a reply to the first, then it may be time for you to check out Typing Break. AppSafari review of Typing Break was written by Vanessa Paszterko on August 30th, 2010 and categorized under App Store, Developers, Productivity. Page viewed 4934 times, 1 so far today. Need help on using these apps? Please read the Help Page. This application is a muti fuctional one,it tutors three diffrent aspect of typing and to come to think of it,it is way way cheap for an avergae Iphone or Ipad user. I must say that, i did like to have it on my Iphone if eventually got lucky to have one.